With the recent Museum Glass® price decrease, we wanted to offer framers a series of blog posts focused on how to maximize the opportunity with tools you can use to position your shop for sustained success, from pricing, selling, and employee training. In this post, industry expert, Meg Glasgow explains the importance of using in- store displays to offer premium products. If you don’t show it, you don’t sell it, has become kind of a motto for my business. While it’s important to be able to talk about my shop’s work in custom framing, my display wall, what I like to call my silent salesperson, does a better job of showcasing my creativity and best design work. One of the best tools for demonstrating the benefits of premium products and design is the silent salesperson. It helps customers envision how your work can enhance their pieces, whether it is treasured memorabilia from a past generation, or a valuable piece of art, or items from an important experience in their lives. If you have display pieces on your wall that showcase quality and creativity, you will inspire customers and get them excited about the possibilities for their projects. 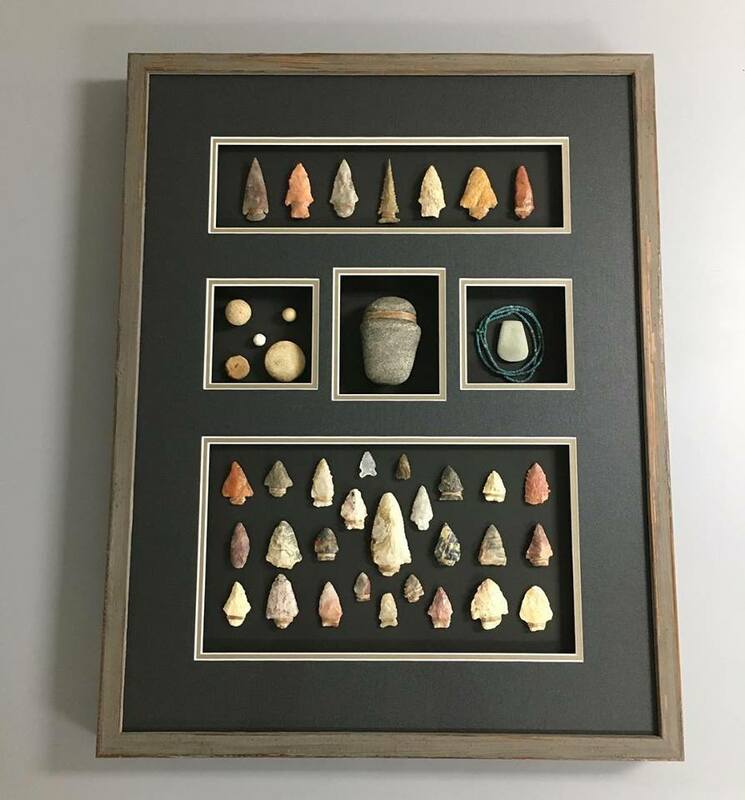 In my shop, I have an entire wall devoted to shadowboxes, and this generates more business for me than anything else, making it a solid return on the investment in resources required. Even for the customers who plan for something much simpler for their pieces, these designs make great conversation starters. Below are four ways you can help your silent salesperson work even harder (and smarter) for your business. Customers become more interested in premium materials when they can see the benefits. Your silent salesperson can help them experience the clarity of Museum Glass and Optium Museum Acrylic®, or the visual impact of stacked frames, or intricately cut mats. Take advantage of opportunities to add something new to your display wall. With the Museum Glass price reduction, switch out the glazing on some of your best pieces that currently don’t feature premium glazing. I use new moulding launches to get discounts to create displays that feature these new designs. Not only does this showcase some of the best materials you have to offer, but it also does the very important job of keeping your displays fresh. Many of your best pieces go home with your customers, but you can feature replicas or pieces inspired by your customers’ design choices on your display wall. Using your memorabilia from vacations, or milestones like graduations or weddings is a great way to give display pieces a more personal appeal. For example, if you’ve done a creative framing package for a wedding invitation, ask the bride and groom for a duplicate. This personal touch and local interest will appeal to your customers, and gives the bride and groom a reason to spread word-of-mouth. Most customers come in with a limited impression of what custom framers can execute. The silent salesperson is ideal for demonstrating the amazing design possibilities that exist beyond the basics. For example, because of its shatter-resistant and anti-static properties, Optium Museum Acrylic can be used in applications beyond simply covering a piece of art. It’s hard to explain just how creative framing can be with this product to your customers without having examples to point to in your shop. To help illustrate this, I have a shadowbox on my wall that features an antique rodeo collar in what appears to be a floating mount over a mirror. I was able to create this by using two pieces of Optium Museum Acrylic, one that floats just above the mirror to which the collar is mounted on and then a second layer of Optium Museum Acrylic. Describing something like that to a customer without a visual aid would be a challenge and certainly not have the same impact as seeing it. Rodeo Collar mounted on a sheet of Optium Museum Acrylic which is in between a mirror and another sheet of Optium Museum Acrylic. For a better description of this project, click here to see a sketch I created for the design. Make sure your best design work is featured on social media and your website. Get photos of your best projects when the customer comes to pick them up and post them to Facebook or any other social media platform you are using. Take photos or a video of pieces from your display wall and walk through the design choices you made, and post these both to social media and on your website. All of this is easier to accomplish with staff training. Your silent salesperson works best if your living and breathing staff understands how to work with it. In the next post of this series, Kirstie Bennett talks about what to incorporate into your training program to help your team members communicate the benefits of premium materials.